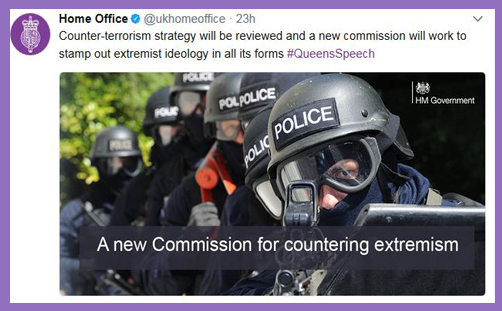 “A commission for countering extremism will be established to support the government in stamping out extremist ideology in all its forms, both across society and on the internet, so it is denied a safe space to spread,” the Queen announced in her speech this week to the assembled Commons and Lords and the State Opening of Parliament. And following the recent spate of terrorist atrocities in Manchester and across London, there is manifest virtue in the proposal. But there is also danger. Everyone knows that the real problem is Islamic extremism (aka Islamism), but for every 50 of those attacks we seem to get deflected by the odd ‘neo-Nazi’ stabbing of an MP to death, or a ‘right wing’ ploughing of a white van into a crowd of Muslims. It’s all extremism, so there must be absolute equivalence. Hence the government’s focus is not on Islamic extremism, but on extremist ideology “in all its forms”. That’s nice and equitable; less Islamophobic and prejudiced. 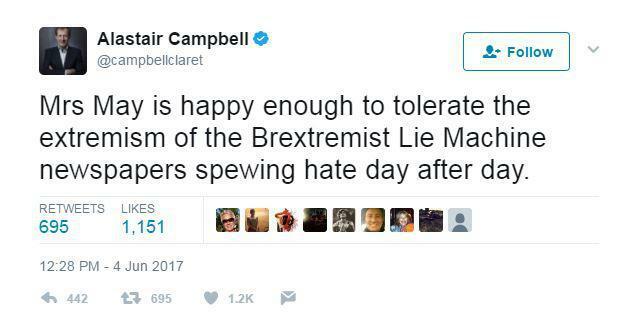 Alastair Campbell, former head of communications at No.10 (so by no means naive on the use of social media), tweeted this in the wake of the London Bridge attack, straight after a speech delivered by Theresa May in which she said Britain is too tolerant of Islamist ideology. His message was clear: Brexit and Jihad are derived from the same fount of extremism; supporters of both are extremists, if not terrorists; a mass political movement for democracy and sovereignty is no different from murderous suicide bombers and machete-wielding fanatics. If a newspaper thinks differently from Alastair Campbell on the subject of Brexit, it is jihadist. So his rage clouded his judgment. Paddy Ashdown, former leader of the Liberal Democrats, believes that Brexit-supporting Conservatives are basically Nazis, and there ought to be no place for such right-wing extremism in our tolerant, respectful liberal democracy. 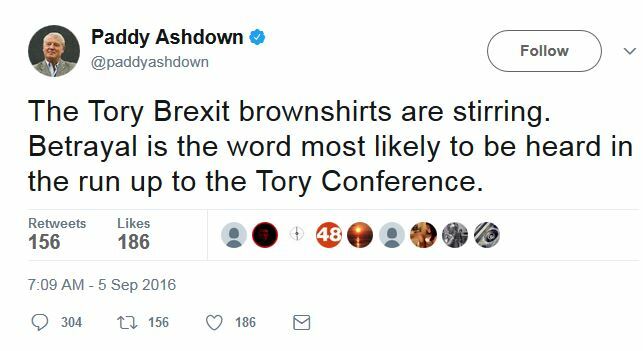 Lord Ashdown has not repented of this tweet: he meant it and still means it. If you think differently from him, you are murdering six million Jews. Intelligent and thoughtful ‘right-wing’ journalists and authors such as Douglas Murray and Melanie Phillips are routinely demonised by the ‘love must overcome hate’ community. Speaking on the BBC, Miqdaad Versi, a spokesman for the Muslim Council of Britain, called Murray a ‘hate preacher’ who should not be allowed to speak in public; there is no place for such Islamophobe extremists on the BBC. The BBC then went on to interview Massoud Shadjareh of the Islamic Human Rights Commission. He, too, called Murray (along with Maajid Nawaz) a ‘hate preacher’ who must be silenced. Neither was in the studio to defend themselves against the defamation: Murray was given no right of reply. The BBC subsequently apologised for the slander. But in the hours, days or weeks and months between an allegation of extremism and the retraction (or tortuous libel action through the courts), the smear of ‘hate preacher’ and ‘far-right extremist’ has been trumpeted by Mehdi Hasan and RT’d around the world thousands of times. The sharing caring left is attempting to shut down all rational analysis of the most pressing disputes of the age. You can be pro-LGBT rights, pro-drug decriminalisation, pro-women’s rights, pro-minority rights and classically liberal on pretty much everything, but if you feel that immigration is too high or there’s a problem within Islam, you’re a xenophobe and Islamophobe. And if you dare articulate your views publicly, you’re a right-wing supremacist hate preacher and extremist. And the government is intent on stamping out extremist ideology in all its forms. Yet the Christian vocation is to be radical for Jesus: all true Christians are extremists, for the gospel of Christ is extreme; the wages of sin is offensive. Theresa May has form which ought to concern us greatly, from her proposed Investigatory Powers Bill to her impulse to establish a National Register of Faith Leaders. The state orthodoxy of ‘British values‘ is likely to form the basis of the definitional touchstone by which extremist ideology is discerned, and so anything that is judged to be ‘intolerant’ or ‘disrespectful’ becomes extremist, no matter how peaceful and moderate the author or speaker may be. Some mosques and madrassas are clearly a problem, but to mitigate allegations of Islamophobia Sunday schools must also be inspected, and any which teach that marriage is between a man and a woman will be judged extremist and shut down, for this is as bad as jihad. Churches which exercise discrimination “veiled as religious conservatism” are manifestly anti-equalities and so extremist and will be shut down. If you think abortion is murder, you’re misogynist and extremist. If you think homosexuality is a sin, you’re a homophobe and extremist. If you think Jesus is the only path to salvation, you’re a bigot and extremist. If you think Islam needs to address Islamism, you’re racist and extremist. The zeitgeist is tolerance, respect, salvific multifaith ecumenism and moral relativity. If you transgress this new infallible orthodoxy, someone somewhere will shriek ‘hate’, the police will descend, interrogate the offender and log the ‘hate crime’ with zeal. It is happening already. One man’s incisive reasoning is another woman’s ‘hate’. One man’s extremism is another man’s orthodox belief. Subjectivity reigns: perception is all. You cannot both stamp out extremist ideology in all its forms and sustain freedom of religion: one must give way to the other. The path is set. It is time to put on the whole armour of God.